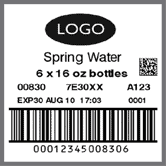 Design and manage complex labels and codes via a WYSIWYG PC interface. Link to database to feed message layouts with product information. Generate GS1 compliant 1D barcodes and 2D codes.